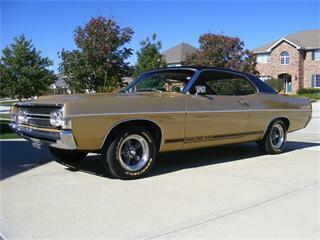 Few stories so well epitomize my childhood than that of my first car, a rusted out 1968 Ford Fairlane. To be fair, it wasn’t truly my first car as my parents retained ownership of it. But it was the car I spent my entire childhood in, the car in which I learned to drive. This was the first brand-new car my father ever bought. Everything else was a used car. It was metallic blue with a vinyl top, a “California edition” of the car, similar in appearance to the photo above except the color. Like pretty much all cars of the day it had a powerful V8, no air conditioning, Philco AM radio. I remember that this car got scorching hot in the summer, back in the days before those cardboard foldable sun shades. (Thinking about it, I remember that the first time I ever saw those sun shades was in 1987 in the parking lot of Disneyland.) We would get in the car and the vinyl seats would be so hot we had to put beach towels on them, towels we kept in the car all summer long just for that purpose. Of course the metal seat belts were much too hot to wear at first so we had to wait a few minutes with the vents blowing before we could buckle up without branding ourselves! 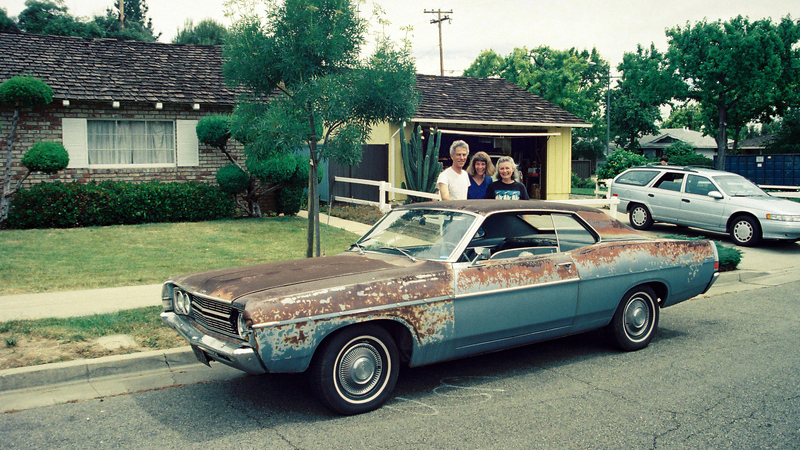 Back in those days, metallic paint wasn’t terribly stable and a black vinyl roof wasn’t ideal for sunny California. Despite my father’s meticulous care and weekly hand-washing, the paint began to chip and the roof started to crack. By the time I learned to drive in it around 1985, large splotches of undercoat were showing through. A minor rear-ending after I got my license resulted in a missing high-beam light. A few years later a piece of the metallic side trim broke off. Inside, the blue vinyl ceiling’s glue came undone and hung, canopy-like, from beam to beam. As the stitching came undone, my father used chopsticks to help hold up the ceiling, leading friends to call it the Chopstick Car. My sister posing on her graduation day with the Chopstick Car. Something about the transmission was fiddly and by the time I learned to drive, you had to reach over the wheel with your left hand, holding the gear lever just to the left of “Park” and turn the ignition key with your right hand, all the while gently pumping the gas with your foot. If you pumped too much, you would flood the engine and had to wait a few minutes before trying again. The car was symbolic of several things: my father’s thrift – he liked the car because unlike the “new fangled” cars that had computerized components, he could get under the hood and do most repair work himself – as well as my parent’s lessons to me and my sister on sufficiency. The car wasn’t pretty. It was actually the ugliest car in our high school’s parking lot by far. But it was good enough to get us where we were going and we didn’t have to pay for anything other than the fuel for the tank. In 1994, when the car was 26 years old, my parents were in the process of selling their house and packing for their move back to my father’s new job in Indianapolis. Just a few days before moving, by complete coincidence, a man driving through the neighborhood stopped and asked if they were interested in selling the car. This solved the problem of what they should do about moving it to Indy. If I recall, the agreed-upon price was something like 50 dollars, cash. 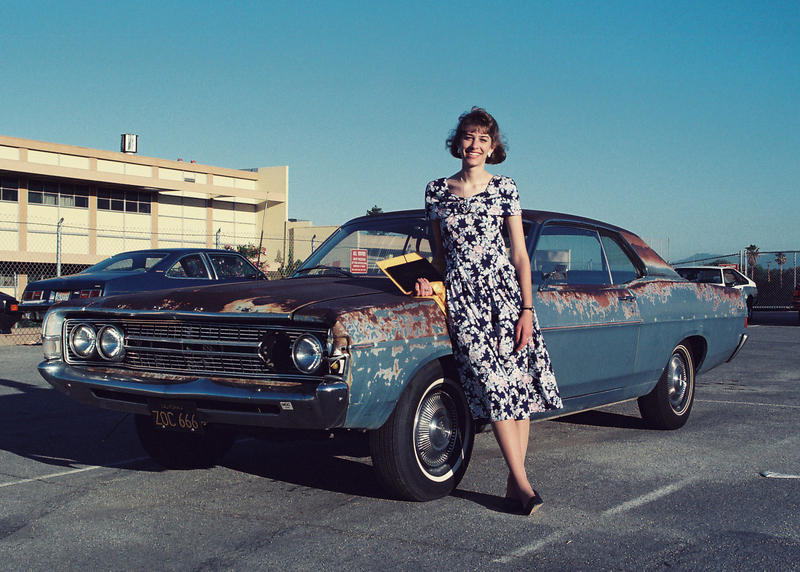 This entry was posted in Uncategorized and tagged 1968, automobile, California, car, Childhood, Fairlane, Ford, memories by christao408. Bookmark the permalink. I totally remember that car. I was surprised it was still in one piece. The station wagon was also another dinosaur that did actually make the trip east. hee heh heh. Wow I have never seen such an old car! Over here, most of our cars don’t stay more than 10 years. Get that one as your new car. Last time I was in BKK I saw many nice vintage cars … like vintage Mercedes, etc. hahaha…good post! It reminds me of my dad’s bicycle. He kept it for almost 30yrs until it was stolen. The bicycle was very clean and still in good condition. The stupid thief thought it was a new one. OK, after reading your post again this car might not be suitable for Thailand’s climate. It still looks nice though. Oh wow! You actually managed to get $50 for that??? Very interesting! I don’t know how to drive and don’t own a car… so I can’t really relate to this post, but I think it’s the same way I feel about my first bicycle. I loved it so much! That pictures sure does bring back memories! Sometime over the past winter, when driving to school, I saw a Ford Fairlane about the same year, although in much better condition which is surprising considering our extreme weather conditions. By the time I drove the car, the chopsticks weren’t doing much good holding up the ceiling and dad had resorted to using paint stir sticks to keep it up. 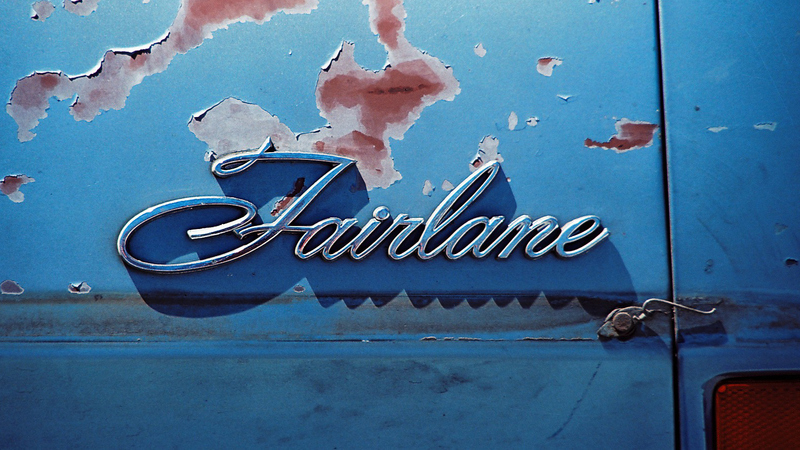 Although embarrassed at the time, the Fairlane did teach valuable lessons and it makes me think about the car the girls will drive in a good 10 years. i remember this car well. As a matter of fact i was in the car when you had that fender bender. It was in stop and go traffic on the freeway, if i recall correctly. @doiturselfer – Correct – it was as we were going under the Saratoga Ave flyover on 280 southbound, on the way to a movie at the Century Theatres on Winchester, I think. As for the house, it was yellow my entire life. @murisopsis – I’m sure if they want a chick magnet enough they’ll save up the money…@oldpartner – Sadly, the car they would probably have been driving in ten years is the one that got sideswiped by that kid! Or maybe the one you got rid of for the van…@Dezinerdreams – Maybe it was just $25… LOL@beowulf222 – Oh, it would rust through in a single rainy season! @foggysunnymorning – When my parents moved back to Indy they took with them two bicycles that had spent the better part of two decades hanging on the wall of the garage. Why they took them, I have no idea…@icepearlz – Pretty much anywhere, few people keep cars much longer than a decade anymore. And, truth be told, most decade-old cars are in pretty good shape nowadays. @stevew918 – Oh, I think we can agree that you’re thrifty, Steve…@stebow – The station wagon was quite a monster, too, but not as pretty. The story with that, though, is how my dad actually REMOVED the air conditioning unit when he bought it so as to reduce the car’s weight and save on fuel. Oi! Nice entry and a change of pace from food and travel. How many miles did the car have when you guys sold it? I just can’t imagine anyone keeping a car for 26 years nowadays. Any idea what happened to the car after your parents sold it? @TheCheshireGrins – Don’t know; it was a random guy who wasn’t from around the area and my parents didn’t keep any contact information. I vaguely recall that he or his son was interested in restoring it; but I wouldn’t testify to that as fact. @ElusiveWords – Thanks, Matt. I’m trying to mix it up a little. I don’t recall exactly but probably at least 150k. This was such a fun entry to read Chris. We had a Oldsmobile Vista Cruiser for almost fifteen or sixteen years, and a Honda Civis for at least twenty five years. M sold it last year and got his Toyota Camry.